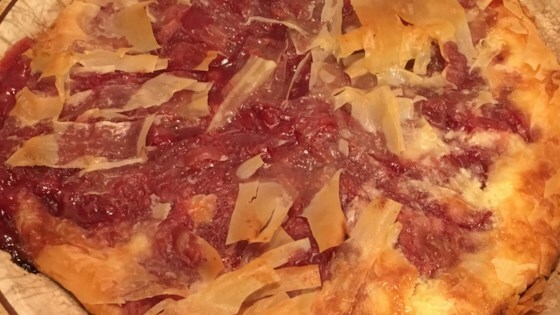 "This unique pie has a light and crispy phyllo crust. You can use the fruit of your choice." In a medium mixing bowl combine cream cheese, sugar, egg, and vanilla extract. Beat until light and fluffy. Set aside. Remove thawed phyllo from package and unroll. Keep stack covered with a damp towel at all times to prevent drying out and tearing. Separate one sheet of phyllo from stack, brush lightly with melted butter or margarine, and place sheet in a 9-inch pie pan. Let edges of dough hang over sides of pan. Continue this process with 4 more sheets of phyllo dough. Spread cream cheese mixture evenly into pan. Spread fruit filling over cream cheese layer. Fold overhanging phyllo dough over fruit layer. Brush another sheet of phyllo with melted butter or margarine and lay over top of pie. Continue this process with remaining 4 sheets of phyllo. Tuck edges of top phyllo sheets inside pie between pan and filling, sealing well. Cut small slits in top layers of dough to allow steam to escape. i tried mine with canned peaches and kiwis. it turned out great. not too sweet or heavy. i ate it for dessert and breakfast! Delicious! I used blueberry pie filling and non-fat cream cheese as well as more phyllo dough on the bottom and top. My family ate this one up in one night. I made this dessert and it was a hit! Everyone loved it. It was the right combination af creamy filling and melt in your mouth crust! Very good, the Phyllo crust is time consuming, would make again with a normal crust. Okay. Not fabulous. Won't make again.